Is three screens on one laptop too many? Why won’t you come on over, Valerie? Turns out, it’s because Valerie is a hefty, 51-inch beast, and also, she’s a laptop, and is therefore incapable of independent movement. Razer have been making gaming laptops and peripherals for years, and each time they come up with something bigger, better and more futuristic than before. Where do we go after 4K, they asked themselves - and the answer, apparently, was more 4K. Two more screens, to be precise, which is what their newest laptop, Project Valerie, can offer. Now, calling this thing a laptop is a bit of a misnomer. For a start, it’s apparently 10-12 pounds, which is like carrying around a chubby cat or a medium bowling ball. You could probably have it in your lap, but your lap wouldn’t appreciate it. ...We take peripheral vision for granted, but there’s a reason it exists: sensing danger. If you’re able to see as far as possible to your side, you can more easily spot if something’s coming to get you. That might not apply to most games, like Gone Home or Journey, but for games like The Witcher and Call of Duty, that might actually add a whole new dimension to how you play. You’d still be paying several grand for peripheral vision, though. 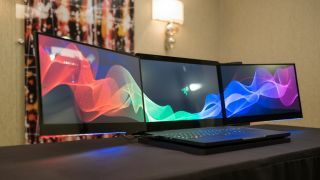 To be totally honest, Razer’s beast of a laptop is a conceptual prototype - you won’t be seeing it on shelves any time soon (the two stolen prototypes notwithstanding), and not just because the shelves would collapse under the weight of several cat-sized machines. It might not be the product that any of us would buy, given the choice between a desktop and three monitors and a very expensive laptop with very breakable hinges on the screens, but there will be someone in the market for something like this. Remember when the iPad first came out? People were confused, wondering what on earth it could be used for (one publication said it would make a great interactive drinks tray), but now it’s a ubiquitous and well-respected piece of tech that single-handedly invented the tablet market. Maybe three-screen laptops are a bit silly. Maybe they'll end up prohibitively expensive, easy to break and very difficult to carry around. But making leaps in technology, even if they seem silly at first, is what leads to innovation. You laugh now, but in ten years, we’ll all be calling our parents from our three-screen phones and buying three-screen baby monitors to make sure our kids are okay from every angle. Just you wait.